Herreweghe has already proved himself a fine Mahlerian with the his recent Fourth Symphony recording, so interest in this Wunderhorn cycle is likely to be very keen indeed. It doesn't disappoint, although it is different in many ways to that Fourth Symphony recording. It was made five years earlier for a start, in 2005, has a different mezzo singing Das himmlische Leben, and is all round a drier and more considered interpretation. The inclusion of Das himmlische Leben is by no means a foregone conclusion, as it is has been excerpted from the Fourth Symphony to provide a supplementary number for the Wunderhorn cycle. 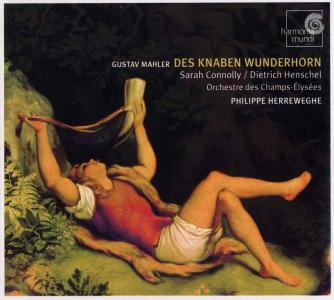 But the fact that Herreweghe has included it allows a comparison of this and his Fourth Symphony recording. And where the more recent symphony recording goes for a bigger, more 'modern' sound, the finale as presented here is much more in 'period' style. We are in a dryer acoustic for one thing, but the sound production, especially from the strings, is also much more controlled. Arguments about which is right and which is wrong fade into irrelevance with a composer who lived at the dawn of the age of the modern orchestral sound. Nevertheless, the Fourth Symphony recording divided opinion, with some questioning Herreweghe's aims in stripping back music that otherwise revels in the lushness of its orchestral textures. Anybody who was of that opinion should probably steer clear of this recording, as it takes the austerity measures a step further. That said, I really like this approach. You do lose something in the bloom of the string sound, but the sheer immediacy of the smaller orchestral textures, especially the woodwind solos, is more than sufficient compensation. And the orchestral playing is excellent, note perfect of course, and with real bounce and sparkle. These short songs don't get much time to establish their pace and mood, so to have players who are so responsive to the character of the music they are playing is a real bonus. Sarah Connelly and Dietrich Henschel are the ideal singers for Herreweghe's approach to this music. Both have a focussed and definite tone, yet both are also sensitive to the chamber music dimensions, implicit in the music, and made manifest by the conductor. Yet even within these more confined parameters, both employ a wide range of timbres and intone the texts with real expression. One whole, I like Connolly's lower range more, and Henschel's upper. Dietrich Hensel has a distinctively burnished tone colour. His voice is reminiscent of Christian Gerhaher, with whom he shares an ability to command musical textures while retaining an endearing sense of fragility in his voice. The sound quality is good, and the balance between the singers and the orchestra is finely judged throughout. I noticed one spot of digital distortion, on the top note of Connolly's first phrase in Das himmlische Leben, which comes as a surprise given Harmonia Mundi's commitment to the highest production standards. Suffice it to say that everything else on the recording, and in its packing, more than lives up to them. The disc is another strong showing from Herreweghe and his Champs-Elysées forces. Their many fans are unlikely to be disappointed.